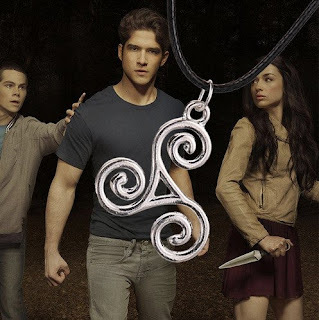 This necklace was inspired by Derek Hale's tattoo on Teen wolf! The triskelion is an ancient symbol with wide and varied meanings. Derek has a triskelion tattooed on his back. Talia Hale used a cheap metal disk imprinted with a triskelion to help each of her children learn to control their shifts during the full moon. The silver-plated pendant measures 2.5cm by 2cm. Black cord chain measures 45cm.